A wanted man who had been on the run for nearly a month has been arrested after a police chase in Ribbleton. Karl Bruney, 29, was arrested after police gave chase to him after he was spotted in the Ribbleton area on Thursday evening. Bruney had been a wanted man after police issued a warrant for his arrest on January 14 after he failed to attend court over a number of alleged driving offences. He was also wanted for breaching his bail conditions. The arrest came hours after a murder investigation was launched in Ribbleton after a body was found on the pavement in Pope Lane. At the crime scene, some residents had speculated that the body belonged to Bruney, a well-know figure in Ribbleton, after police mistakenly reported that the victim was male. Karl Bruney, 29, was arrested on Thursday, February 7. 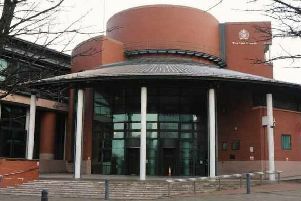 A warrant had been issued for his arrest after he failed to appear at Preston Crown Court over a number of driving offences. By late Thursday morning, rumours of Bruney's death had swept the Moor Nook estate, with relatives turning up at the crime scene to seek answers from police. A number of premature tributes to Bruney even appeared on social media. Rumours were only dispelled after police issued a correction stating that the murder victim had been identified as a woman.